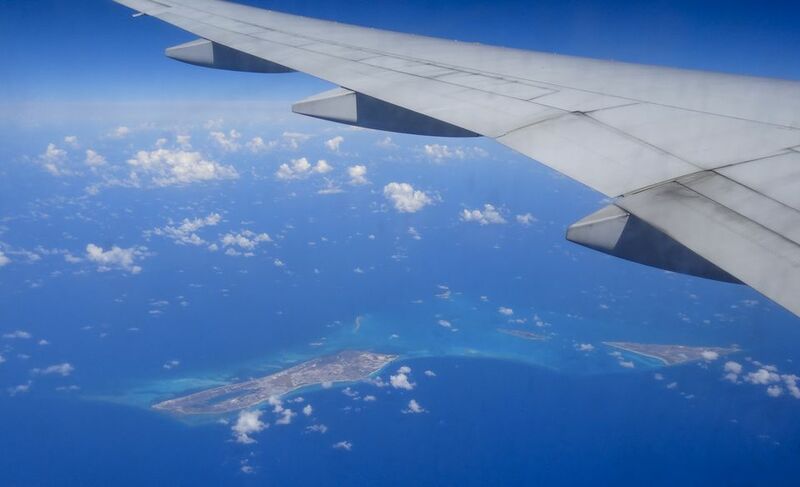 Nassau is the main international travel hub for the Bahamas, and while Freeport, the Exumas, and other Bahamian destinations have their own airports, Lynden Pindling International Airport (NAS) is by far the largest and busiest. Located on the western end of New Providence Island, the airport is about 20 minutes from downtown Nassau (when there's no traffic, anyway) and very convenient to the hotels on Cable Beach, including the new Baha Mar development. Paradise Island is a bit further away -- about half an hour drive by taxi or rental car. NAS is served by multiple major international airlines with daily service to and from destinations all over the world. The Nassau airport terminal is modern, air-conditioned, and handicapped-accessible; a recent redevelopment project has transformed this facility from an unpleasant eyesore into one of the Caribbean's best airports. Arriving passengers are greeted with music from a live band while waiting to clear local immigration and customs and, often, a chatty pirate as well (Nassau was once a notorious pirates' haven, and was burned to the ground in the 18th century as a result). Amenities include ample dining choices, duty-free and souvenir shopping, and a bright food court with indoor and outdoor seating. Nassau's Graycliff hotel operates a very nice VIP lounge, with access available to hotel guests, customers who purchase a certain amount in the adjoining Graycliff shop (selling branded cigars, chocolates, high-end liquor, and other gifts), or for a fee. The lounge also is the only place in the airport where you can smoke -- including those famous Graycliff cigars! All airport gates are located in a single building, with A,B, and C terminals dedicated to U.S. Departures, International & U.S. Arrivals, and International & Domestic Departures, respectively. Signs boast that no gate is more than a five-minute walk from the central hub. Wifi is available in the airport terminal; you can get up to 30 minutes of Internet access free of charge. Dining options include a food court with a Wendy's, Quiznos, and Parma Pizza; a Dunkin' Donuts also is nearby, along with the table-service Rhythm Cafe. Shopping options include Del Sol (color-changing clothing), John Bull (cosmetics), Piranha Joe (beachwear), the Last Straw (straw hats and bags, albeit not at the bargain prices you'll find at Nassau's straw market), Uniquely Bahamian (locally made products), and the Ole Nassau duty-free shop, which sells the local Ricardo and Old Nassau rums. Nassau is one of the few Caribbean airports where you pre-clear U.S. Customs before you depart. The modern, new Customs area includes 20 automated, passport-reading kiosks as well as 15 manned Customs booths, and on a quiet day, most travelers will cruise through in moments. Still, this can be a very busy airport, so departing visitors are advised to arrive at the airport three hours early in order to safely negotiate check-in, security, and Customs. Nassau has some of the best airlifts in the Caribbean, with 21 airlines currently providing service, including relative newcomer Southwest Airlines. Taxis, shuttle buses, and local buses provide a variety of ground transportation options for Nassau visitors. Customer service is another area of vast improvement at the airport, with friendly and informative transport officials on hand to guide arriving visitors swiftly to cabs, buses, and other ground transportation. Majestic Tours and other local companies offer shared bus transfers to local hotels that will cost you somewhat less than a taxi. Nassau's colorful and cheap system of jitney buses, unfortunately, do not serve the airport but are a great option for daytime travel between the major hotel districts and downtown. Rental cars are available at the airport. Vendors are Avis, Budget, Dollar/Thrifty, and Hertz. The massive Baha Mar development has helped spur construction of an excellent new four-lane roadway system on the western end of New Providence Island, vastly improving connections between the airport, Cable Beach, and downtown Nassau. That said, driving through the heart of Nassau can be a slow journey, especially when cruise ships are in town (which is almost always) and the streets are jammed with thousands of pedestrians, cabs, and buses.